Portmeirion – an example of a great tourist experience | What More Can There Be? Having been a tourist in Snowdonia, North Wales for a week, I’ve been subjected to a glorious array of customer experiences. Having worked on a programme for a Scottish Tourist Organisation in the past I have become acutely aware of the challenge faced by destinations in giving a consistently good customer experience. After all it only takes one bad experience for the whole tourist industry in a place to become tarnished. In popular spots the tourists will come no matter what. If you have a Castle, beach or panoramic view, this will attract visitors. There is however an inherent problem for us tourists. Since we will visit the spot infrequently it doesn’t matter to those delivering service what sort of experience we have. If we have saved our Yen and travelled from Tokyo, for example, what are the chances of us ever returning? It seems that some attractions, shops and hotels recognise this and are simply intent to take as much money from tourists as possible for the least effort. The glossy brochure promises a ‘warm’ welcome but rarely delivers. So when an attraction delivers, it stands out. 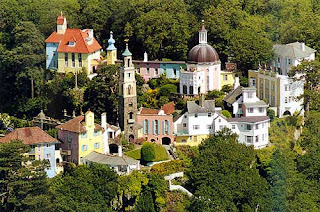 I have to say when my family decided we should visit Portmeirion; the ‘folly’ village created by Sir Clough Williams-Ellis, overlooking the estuary of the River Dwyryd near Porthmadog, I was keen to do something else. In my mind here was a honeypot intended purely to attract tourists. To some extent its architect always had this in mind since he always recognised he needed visitors to fund his designs. When we arrived I was not best disposed to the adventure and all my preconceptions were being met by the time we had paid for admission. At this point we were greeted by John, who offered us a guided tour. Suddenly, I felt welcome. He enthused about the place, its history and the philosophy of its creator. He must have done this a thousand times but it didn’t show. His tour felt like it was just for us. Our experience was the epitome of the values Williams-Ellis had wanted for Portmeirion and I have to say all the staff we encountered lived up to them. Portmeirion was a rare treat for a tourist, somewhere which promised much and actually, for me, over delivered. The Ffestiniog Railway was also worth a visit for the same reason. This entry was posted in Customer Experience on May 3, 2011 by dave5621.